This week in our time capsule news round-up we have questions about the World Series of 2213, the retro-futuristic death of a monorail in Australia, and a bunch of 1988 music that's scheduled to be unearthed 75 years from today. A time capsule in northern Minnesota that was first compiled in 1988 was finally interred in concrete this week, sending it on a journey to the year 2088. The collection of over a dozen items has apparently been stuck in some kind of time capsule purgatory for the past quarter of a century. But when it's finally opened, it will celebrate the town of Ely's bicentennial. Ely is known as the gateway to the Boundary Waters Canoe Area, a popular camping destination made up of thousands of lakes, and where motorized boats are strictly forbidden. The Ely capsule includes photos, menus from area restaurants, and fishing lures, among many other items that have particular associations with the town as a tourist destination in the '80s. Stamps from the 1988 Olympics, computer discs, a JCPenney catalog, and a videotape promoting tourism in Ely were stuffed into the large cylinder. There were also four 45rpm records, including “Monkey” by George Michael, “1-2-3” by Gloria Estefan, “It Would Take a Strong, Strong Man” by Rick Astley, and “Perfect World” Huey Lewis and the News. Australian Kid From 1988: In The Future, "Girls Might Wear Pants"
Sections of the recently dismantled Sydney Monorail were installed in Google's Australian offices earlier this month. But back when the monorail first opened in 1988, kids at a nearby school in Toronto, Australia saw it as beaming a symbol of the future. Students in Toronto unearthed a time capsule this week and found predictions from kids of 1988, including some who thought that the monorail would become the preferred method of transportation for kids in 2013. As the Lakes Mail reports, the predictions range from the extinction of paper books to the rise of computer teachers. One kid even predicted that it wouldn't be monorails, but rocket ships that got students to school. Another student predicted that in the future, "girls might wear pants." Though I assume that this prediction maybe has something to do with school uniforms, rather than women just generally wearing pants. Getting school kids to write letters to the future is an incredibly popular exercise. But sometimes the assignment requires thinking a bit more long-term — like when all those kids will be dead and gone. A school in the Tuscarora District on the border of Pennsylvania and New York did just that when it recently asked kids to write to the people of 200 years in the future. The letters will be included in a time capsule which will be sealed in the new Tuscarora Heroes Monument, which commemorates an attack on Lewistown, New York in the War of 1812. The monument will be unveiled on December 19th. Many of the children who wrote to the year 2213 live on the nearby Indian reservation and their letters take form of questions, asking what the reservation might look like in the future. "What does the Nation house look like," Romeo Fitzgerald asks, "Who is the president? Is our language still spoken? Are the Six Nations still at peace? Who won the (2213) baseball World Series?" "Is our National Picnic still going on? Is our beadwork still alive?" writes student Connor Green. What&apos;s This Weird "Tool" Just Unearthed in a Time Capsule From 1927? There are hundreds of stories about lost time capsules bringing old classmates together. But often the capsule's exact location remains a mystery. 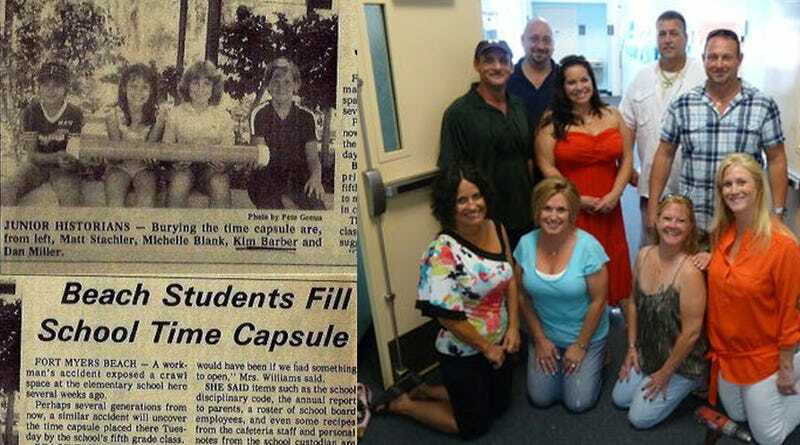 Such was the case this week in Fort Myers Beach, Florida, where elementary school classmates reunited this past week with a mission to find a time capsule that had been sealed in a Beach Elementary School wall in 1981.